Panner’s disease affects the dominant elbow of children, mainly boys, between the ages of five and 10. For unknown reasons, normal growth in the outer edge of the elbow is disrupted, which causes the small area of bone to flatten out. The child begins to complain of pain during activity. The pain eases with rest. Over a period of one to two years, the bone slowly rebuilds itself. During this time, symptoms gradually disappear, although the elbow may never fully straighten out. Panner’s disease is similar to osteochondritis dissecans, a condition that occurs after the skeleton is done growing. Both conditions are most common among certain young athletes, especially baseball pitchers and gymnasts. What part of the elbow is affected? The elbow is the connection of the humerus (upper arm bone) and the two bones of the forearm (the ulna and the radius). The radius starts on the outer edge of the elbow and runs down the forearm to the thumb-side of the wrist. 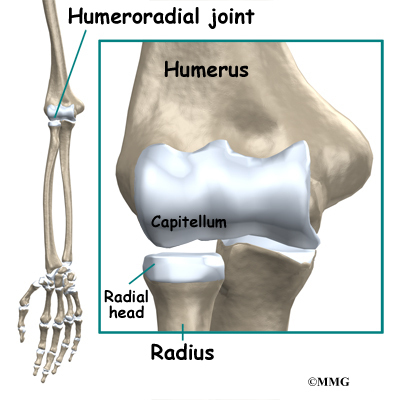 The joint where the humerus meets the radius is called the humeroradial joint. This joint is formed by a knob and a shallow cup. The knob on the end of the humerus is called the capitellum. The capitellum fits into the cup-shaped end of the radius, also called the head of the radius. When the head of the radius spins on the capitellum, the forearm rotates so that the palm faces up toward the ceiling (supination) or down toward the floor (pronation). The joint also hinges as the elbow bends and straightens. Panner’s disease affects the developing bone within the capitellum of the humerus. This unique condition is part of a category of bone development disorders known as the osteochondroses. (Osteo means bone, and chondro means cartilage.) In normal development, specialized bone growth centers (called growth plates) change over time from cartilage to bone. The cartilage cells within the growth plates actually change into bone cells. As this occurs, the growth centers expand and unite. This is how bones grow in length and width. Bone growth centers are located throughout the body. Panner’s disease involves disruption of the growth plate of the capitellum. Scientists are not exactly sure how the growth plate within the capitellum is disrupted. Some think the problem is hereditary (handed down in the genes). Others believe that small strains add up over time, such as from repeatedly throwing a ball. Another possible cause is that the tiny blood supply to the humeroradial joint is somehow blocked. During development, only the ends of a few small blood vessels enter the back of the humeroradial joint. If this scarce blood supply is damaged, there is no back-up. The cells within the growth plate of the capitellum die, causing the knob of bone to collapse. Regardless of how the problem starts, the next stage in Panner’s disease is cell death within the growth plate of the capitellum. The death of these cells comes from avascular necrosis. (Avascular means without blood, and necrosis means death.) When necrosis occurs, the bony knob of the capitellum begins to flatten out. It flattens out because the newly formed bone begins to be absorbed by the body. Then, over a period of one to two years, new blood vessels enter the area, and new cells begin to form within the growth plate. These cells help gradually rebuild the original shape of the capitellum. Panner’s disease affects the growth plate of the capitellum in children under the age of 11. As mentioned earlier, a separate but similar condition that affects the capitellum of older children and adolescents. This separate condition is called osteochondritis dissecans (OCD). In older children, OCD of the capitellum doesn’t involve the growth plate. Instead, the problem affects the smooth covering of the capitellum called the articular cartilage. OCD also affects the bone just below the articular cartilage, called the subchondral bone. Symptoms usually come on without notice. The child rarely remembers a specific event or injury to explain the symptoms. The child may report tenderness on the outside edge of the elbow, near the capitellum. Pain generally worsens with activity and eases with rest. The elbow often feels stiff, and the child is unable to completely straighten out the elbow. Symptoms from Panner’s disease generally go away gradually as the bones mature, usually over a period of one to two years. However, the condition may leave the child unable to fully straighten the elbow. The doctor will want to know the child’s age, activity level, and which arm is dominant. In the physical exam, the sore elbow and healthy elbow will be compared. The doctor checks for tenderness by pressing on and around the elbow. The amount of movement in each elbow is measured. The doctor checks for pain when the forearm is rotated and when the elbow is bent and straightened. X-rays are needed to confirm the diagnosis. X-rays let doctors see the shape of the capitellum. An elbow X-ray may show an irregular surface on the capitellum. The entire growth plate may appear fragmented and transparent. Transparent areas mean that the bone that makes up the capitellum has been absorbed. The capitellum may appear flattened out, which means that the bone has collapsed. Within a period of one to two years, an X-ray comparison will usually show that the capitellum has completely grown back to its normal shape in patients with Panner’s disease. Occasionally, a magnetic resonance imaging (MRI) scan may show more detail. The MRI can give a better view of bone irregularities. The MRI can also detect swelling. In some cases of Panner’s disease, children may need to stop sports activities for a short time. This gets the pain and inflammation under control. Usually children don’t need to avoid sports for long. Sometimes, the passing of time may be all that is needed. It takes one to two years for the growth plate that makes up the capitellum to grow into solid bone. At this point, pain and symptoms usually go away completely. The doctor may prescribe anti-inflammatory medicine to help reduce pain and swelling. Physical therapy treatment may also be recommended. In severe cases, when regular treatment is not effective, doctors may recommend that the child wear a long-arm splint or cast for three to four weeks. The goal is to stop the elbow from moving so that inflammation and pain go away. The symptoms of Panner’s disease usually disappear when the growth plate in the capitellum finishes growing. Surgery is not generally an option for Panner’s disease. In nonsurgical rehabilitation, the goal is to reduce pain and inflammation. Nonsurgical treatment can help ease symptoms of Panner’s disease. Some doctors have their patients work with a physical therapist. Treatments such as heat, ice, and ultrasound may be used to ease pain and swelling. Therapists also work with young athletes to help them improve their form and reduce strain on the elbow during sports. When symptoms are especially bad, patients may need to avoid activities that make their pain worse, including sports. Symptoms from Panner’s disease tend to go away slowly over time. This means that nonsurgical rehabilitation doesn’t really cure the problem. Treatments can only help by giving short-term relief from symptoms.